Levi’s Stadium, located in Santa Clara, California, is the home of the San Francisco 49ers and widely considered the “next generation” of stadium design. The stadium opened in July 2014 after almost two years of construction and hosted the 50th SuperBowl. The new stadium moved the team out of Candlestick Park in San Francisco, into a location with about double the stadium square footage, better freeway access, and more than twice the parking spaces. Designed by HNTB, the stadium needed to meet budget and schedule requirements, utilize green technology, and be a multi-use facility to events such as football, wrestling, ice hockey, soccer, concerts, and more. With a capacity of 83,000 and as many as 30,000 parking spots, large construction projects such as Levi’s Stadium can include significant expanses of runoff-generating hardscape. If rain can turn a football field to a mud pit, it can also turn a parking lot into a flood that can potentially leak into spaces underneath the stadium such as corridors, locker rooms, event spaces, offices, and mechanical rooms. Walls with superior moisture resistance are required. Additionally, parking lot runoff carries with it petrochemical pollutants that drip or leak from vehicles, as well as litter and other debris. The new stadium sits adjacent to San Tomas Aquino Creek, which flows directly into the Guadalupe Slough and San Francisco Bay, sensitive ecologies less than six miles away. The site is on land with a high water table, and existing storm-drain lines are located not very far below the surface. 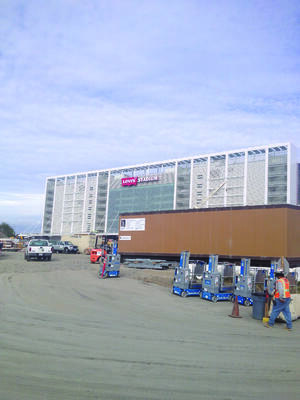 In order to put Levi’s stadium at the top of the class, integral water solutions were implemented from Oldcastle Infrastructure, A CRH Company, and the Echelon Masonry product line from Oldcastle APG, A CRH Company. 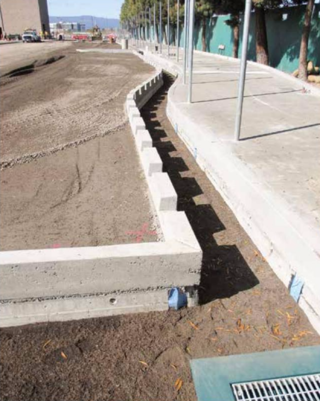 To handle stormwater in the parking lots, access roads, and other hardscape surrounding the stadium, GHD Engineering selected several of CRH's stormwater management product, including the BioMod® Modular Biofiltration System, a stormwater collection and natural treatment system. Biofiltration is one of the simplest, most natural, and most cost-effective ways to collect runoff and treat it onsite, and it is considered a best practice under U.S. Environmental Protection Agency (EPA) guidelines for low impact development. BioMod is a modular system of precast concrete biofiltration units. The fully deployed system looks to the casual observer like nothing but a flower bed or tree-planter, with the earth-level somewhat lower than the surrounding pavement. Beneath the surface, it is a series of concrete cells filled with layers of mulch, biofiltration media, and drainage rock, with pipe in the bottom to carry treated water out of the system. The filtered water is collected in a perforated pipe that runs through the bottom of the biofiltration system and carries water into a storm drain system. Filtered pollutants are naturally broken down by microbes and provide nutrients for the plantings in the module. Plants and trees are irrigated by the rainwater. In locations where rainfall may not be frequent or consistent enough to sustain them – such as Levi’s Stadium – integral drip irrigation lines that are built into the modules can deliver irrigation water. In addition to the above ground BioMod units, the engineers also utilized underground stormwater treatment systems, including Dual Vortex Separators for hydrodynamic separation and several PerkFilter™ Media Filtration units. Together, the systems provided a comprehensive approach to managing and treating pollution from the site’s stormwater runoff. 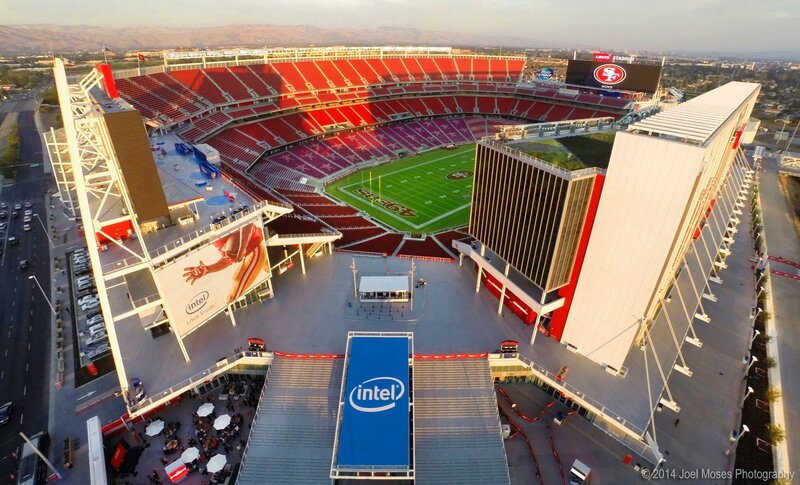 Click here to learn more stormwater solutions at Levi’s Stadium and how BioMod helped with the challenges and special conditions. The key to using concrete masonry effectively for the long term is managing moisture, as moisture has been the number one cause of structural deterioration for as long as structures have been built. When it came to the construction of this new stadium, concrete masonry was chosen for its versatility, durability, and structural qualities. Amerimix Pre-blended Type S mortar with an integrated water repellent was used underneath the stadium for corridors, locker rooms, storage and mechanical rooms, and even a detention area for rowdy fans. Water-repellent mortar with RainBloc was specified for use in the architectural ground face blocks for an exterior wall. Integrated water solutions from CRH helped contribute to Levi’s Stadium receiving a LEED (Leadership in Energy and Environmental Design) Gold Certificate. It is the first professional football stadium in the United States to receive this certification as new construction. In addition to its innovative and green standing, the Levi’s Stadium biofiltration system will largely maintain itself, keeping the grounds looking good and safe from flooding, and protecting the San Francisco Bay and sensitive areas surrounding it from contamination. Pollutants are kept out of the bay, but no chemicals are used, there are no moving parts to maintain, no energy is consumed to do it, and maintenance is minimized. Learn more about stormwater, green building codes, and how long-term stormwater management is possible.